If we look closely at Courbet’s painting The Stonebreakers of 1849 (painted only one year after Karl Marx and Friedrich Engels wrote their influential pamphlet, The Communist Manifesto) the artist’s concern for the plight of the poor is evident. Here, two figures labor to break and remove stone from a road that is being built. In our age of powerful jackhammers and bulldozers, such work is reserved as punishment for chain-gangs. Unlike Millet, who, in paintings like The Gleaners, was known for depicting hard-working, but idealized peasants, Courbet depicts figures who wear ripped and tattered clothing. And unlike the aerial perspective Millet used in The Gleaners to bring our eye deep into the French countryside during the harvest, the two stone breakers in Courbet’s painting are set against a low hill of the sort common in the rural French town of Ornans, where the artist had been raised and continued to spend a much of his time. The hill reaches to the top of the canvas everywhere but the upper right corner, where a tiny patch of bright blue sky appears. The effect is to isolate these laborers, and to suggest that they are physically and economically trapped. 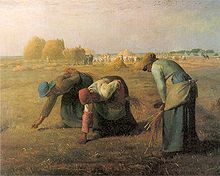 In Millet’s painting, the gleaners’ rounded backs echo one another, creating a composition that feels unified, where Courbet’s figures seem disjointed. Millet’s painting, for all its sympathy for these poor figures, could still be read as “art” by viewers at an exhibition in Paris. 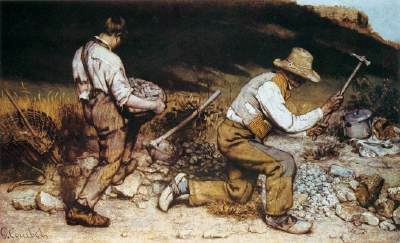 Courbet wants to show what is “real,” and so he has depicted a man that seems too old and a boy that seems still too young for such back-breaking labor. This is not meant to be heroic: it is meant to be an accurate account of the abuse and deprivation that was a common feature of mid-century French rural life. And as with so many great works of art, there is a close affiliation between the narrative and the formal choices made by the painter, meaning elements such as brushwork, composition, line, and color. Like the stones themselves, Courbet’s brushwork is rough—more so than might be expected during the mid-nineteenth century. This suggests that the way the artist painted his canvas was in part a conscious rejection of the highly polished, refined Neoclassicist style that still dominated French art in 1848. Cite this page as: Dr. Beth Harris and Dr. Steven Zucker, "Gustave Courbet, The Stonebreakers," in Smarthistory, August 9, 2015, accessed April 22, 2019, https://smarthistory.org/courbet-the-stonebreakers/.